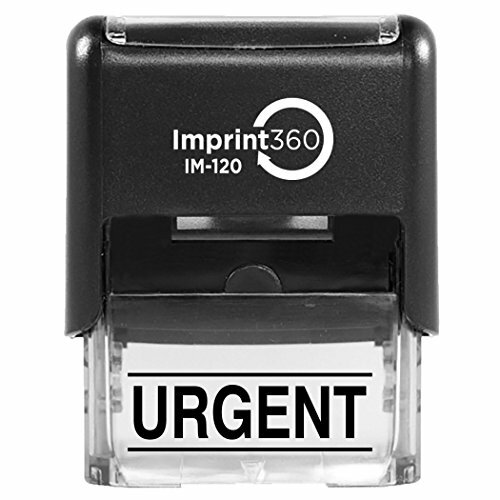 Imprint 360 your #1 source for quality business products specializing in stamps and signs URGENT w/upper and lower bars Premium Self-Inking Rubber Stamp. Imprint 360 Part No. AS-IMP1133K. Black Ink. 9/16" x 1-1/2" Impression Size. Commercial Quality. Clear base allow for precise alignment of stamp to your work. The stabilizing rubber feet keep the stamp more stable than most to virtually eliminator slips and miss stamps. Laser Engraved rubber for Clean, Precise Imprints. Makes approximately 5,000 impressions before needing to be re-inked Self-inking stamps have an integrated stamp pad so a separate stamp pad is not required. The stamp mechanically re-inks itself after every impression by retracting the rubber plate and resting it on the ink pad. Self-inking stamps are the most popular because of their high quality and moderate price. These stamps are ideal for quick, repetitive stamping, giving thousands of impressions.